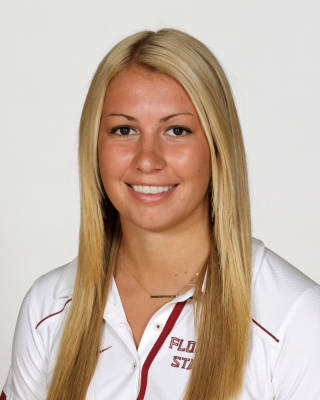 Following an outstanding career in the Garnet and Gold, Katie Mosher joins the Florida State coaching staff for the 2015 season as a volunteer assistant. Is currently a member of the Florida WAVE – A PVL Volleyball team that placed fourth at the 2015 PVL Championships. – Was a finalist for the Senior CLASS Award where she captured Second-Team All-American honors. – Was named to the All-ACC Academic Team. – Earned the ACC Postgraduate Scholarship along with two other Seminoles. – Earned an AVCA All-America honorable mention in 2014. – Captured All-ACC First Team honors. – Became the FSU All-Time Digs leader after a 34 career high dig performance in the 3-2 win over Miami. Finished her career with 2,123 total digs. -Has surpassed the 2,000 dig mark for her career after amassing 21 in the 3-1 win over Virginia. – Selected for the 2014 Preseason All-ACC Team. -Started the year ranked 10th in the ACC All-Time Career Digs Per set list (4.45). – Surpassed the 30 dig mark three times in 2014 in the wins over Auburn (30), Nebraska (33) and Miami (34). -Turned in her career high for assists with nine in the five-set win over Miami. – Ranks ninth on the Active NCAA All-Time Career Digs List. – Was named to the Four Points by Sheraton Seminole Invitational All-Tournament Team. – Opened ACC play averaging 6.50 digs per set in the sweeps of No. 12 North Carolina and Notre Dame. Tallied 19 digs against the Tar Heels before registering 20 against the Irish. -Became the 11th four-year senior class and Coach’s Poole fourth-straight to achieve the 100-win milestone (Oct. 17 vs. Florida A&M). Finished her career with a overall record of 112-22. -Is in her third season as team captain. -Produced 518 digs for the second highest total in program history. – Had 21 aces in 2014. – Posted 20+ digs in 11 matches in 2014. – Was voted by her teammates as the Most Influential Player at the end of the year banquet. – Was selected as the Golden Nole Award Winner for Volleyball. -As a team captain, Mosher turned in another top-notch performance in 2013, amassing 506 digs on the year and good enough for the fifth-best showing in school history and was third in the ACC with a 4.52 digs per set in conference play. -Finished the year with a career total of 1,605 digs, moving her into third place on the FSU all-time digs list. -Posted her season-high in the 3-1 win at Miami with 28 digs. It was the third highest four-set performance in the ACC this season. -Was named Second Team All-ACC for the first time in her career. -Averaged 4.29 digs per set throughout 2013. -Earned the Ultra Competitive Award at the end of the year banquet. -Was named to the 2013 ACC Academic Team. -Recorded a season-high seven assists in the 3-0 win over Syracuse. – Selected as the Golden Nole and Golden Torch Award winner for the 2013-14 academic year. -Was invited to the U.S. Collegiate National Team Program in the summer of 2014. Born on Jan. 19, 1992 … majoring in sport management … daughter of Bob and Lanie Mosher … her father Bob was the co-inventor of popular snack Bagel Bites … favorite movie is “The Dark Knight” … career ambition includes coaching or working as a sports rep for an established brand such as Nike … played basketball and volleyball in high school … enjoys playing at Miami because it draws a good FSU crowd on the road … television show she watches is “Suits” on the USA Network … favorite accessory in her wardrobe are her heels and shoes … has worn the No. 2 jersey since middle school … one of her superstitions includes painting her nails the color of the opposing team on match day … favorite home cooked meal is her mother’s Italian and lemon chicken … person in sports she’d most like to meet is Michael Jordan … proudest moment was walking on the court in the NCAA national semifinals in 2011…was the FSU Volleyball selection for the Golden Nole twice…earned theBVHS Recognition Award at the Senior Awards Banquet – an award given byBishop Verot that recognizes a former alumni that is a collegiate senior that has made an impact in their sport at an elite level as a player, leader as well as academically.